About 18 hours ago, my wife and I walked to the mailbox on Park Blvd., then down from Monroe towards Meade. A few doors before the pie shop on the corner, Annie spotted an orange-and-white furball in an apartment courtyard. There we met Riley and owner Kim, who occasionally takes him out for supervised romps. He is a San Diego shelter cat, who was an estimated four years-old when she adopted him nine years ago. He wasn’t neutered beforehand, and Kim remarked on the animal’s street-savvy ways and rippling muscles. Accustomed to foraging, Riley would burrow into garbage bags scrounging for food if left unattended. Every once and awhile, the old habit returns. I shot 14 pics of the male marauder, choosing Featured Image in part for the unexpected companion—calico Woo, who I hadn’t seen in the courtyard for nearly six months. This capture comes from the apartment complex’s back area—somewhere I wouldn’t otherwise go if not invited by a resident. You see a crop from the Fujifilm X100F, set to Classic Chrome film simulation. Vitals: f/5.6, ISO 200, 1/250 sec, 23mm; 12:23 p.m. PDT. Woo is the third cat to appear in this series; yesterday Annie and I learned the tragic fate of her littermate, whom we often would see lounging nearby her sister late afternoons. Riley’s owner heard part of the commotion that doomed the other calico. 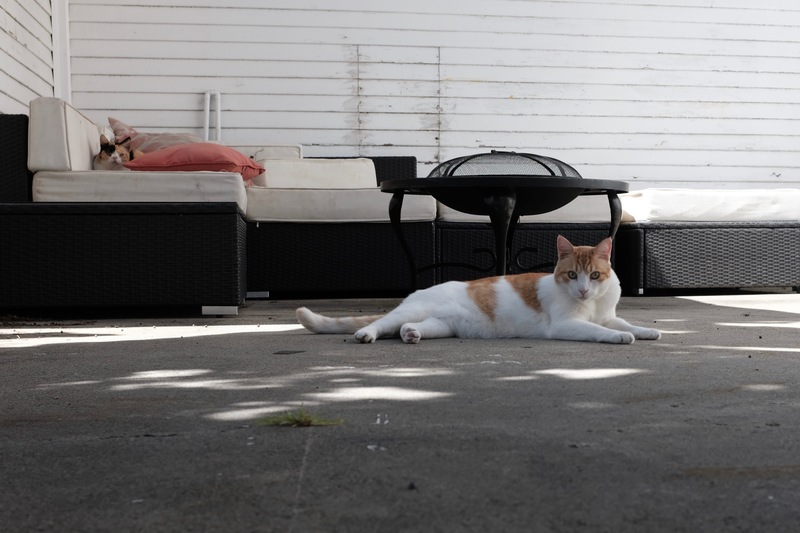 The kitty reclined in the courtyard nearby the sidewalk, from where a dog rushed, grabbed her, and bolted away. Apparently, bystanders ran after the beast—some drivers even pulled over their cars trying to rescue the cat. She limped back home, a bundle of misery; the injuries were too many, and she was put down the next day. Nights that followed, in the courtyard, Woo meow-cried out for her missing sister (the owner got them together as kittens). Where two felines lounged often, one rarely makes appearance. Hence, why I hadn’t seen Woo for so long. Previously featured felines: Scruffy, Roly Poly, Woo, Skull, Biscuit, The Colonel, White, Chipper, Frisky, Stretch, Needy, Farfisa, Mates, Hunter, Pee-Pee, Blue, Blue Too, Bonded Pair, Patience, Fess, Jumper, Frenemy, Looker, Cozy, Scout, Lurks, Skit, Mini, Betty, Black and White, Stalker, Bell, Chill, Sammy, Scratch, Poser, Star, Grey and White, Watcher, Herman, Comet, Roman, Willow, Chub, Nimbus, Watson, Lilo, Kit, Pepe, Twilight, Sebastian, Spot, Booger, Ash, and Veruca.